"How many more times does it have to be explained to you?" It's two days before the final Lions Test and, with Warren Gatland having dropped Brian O'Driscoll to global outrage, nerves are shredding at the squad's north Brisbane base . A strong personality needs to step in. So a strong personality steps in. 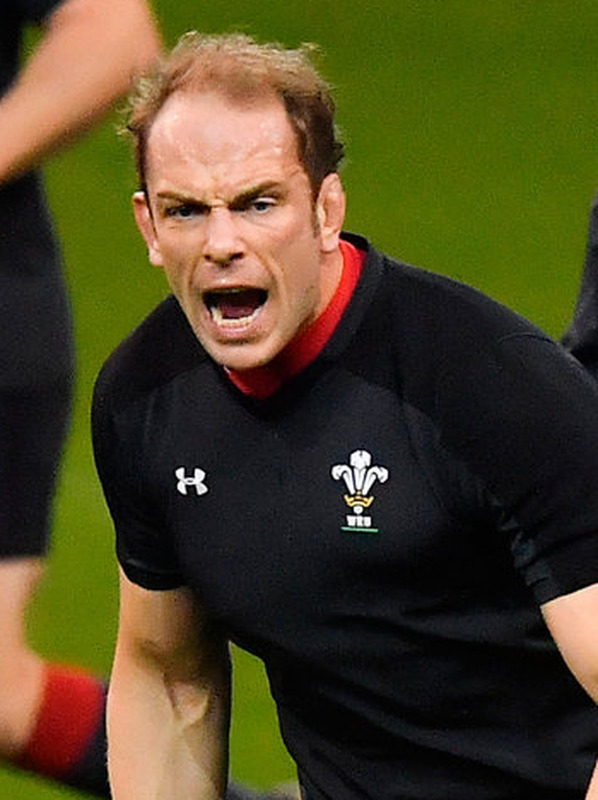 Alun Wyn Jones (below) has just been promoted to captain, standing in for the injured Sam Warburton. The series is on a knife-edge; so is this fraught training session. What he says now, as his boyhood friend Richard Hibbard points daggers at Sexton and then beseeching eyes at his captain, will make all the difference. "He's right, you know, lads." They get back to work. The tension remains, but is re-focused. Two days later, they would all come together in Sydney to make history. Nothing illustrated more graphically the leadership qualities of Alun Wyn Jones. Only one thing mattered. That the team be constructed in the image of its leader. Stronger together. Today, he carries the weight of an expectant nation. They could find no better representative to freight the weight of all their hopes and dreams. If one includes the Lions - as one should - today will mark the 134th Test in the remarkably enduring career of Alun Wyn Jones; his 124th in a Welsh jersey and his 25th (26th including that Sydney Lions' series clincher) as captain. He will draw level with Gethin Jenkins and then only four men stand above him; Richie McCaw (148), Brian O'Driscoll (141), George Gregan (139) and Sergio Parisse (137). A one-club man, he has played 268 times for Swansea/Ospreys; throw in his underage career and he has participated in well over 400 games of a sport that become increasingly more brutal with every passing season. Hard to fathom that, despite the relentless daily punishment he has endured, he is still just 33. He was always marked out as someone who could become a great player but perhaps not one who would emerge as an equally renowned leader of men. "He has matured gracefully," noted Warren Gatland this week as both men eye a third Grand Slam together; as many as Ireland have won in their entire history. "In the early years he was a bit hot-headed and temperamental. He was the one starting the fights in training and stuff." He has always been as intense off the field but time's tide and the sense of a career nearing its end has becalmed him; so too family life; a second child arrived last year. Others noticed the change too, including another lifelong friend and fellow Welsh warrior, Adam Jones. "He has chilled out a lot," avers the former Grand Slam-winning prop. "Just mellowed a bit. "He was very intense about everything. Took himself very seriously. He still does a wee bit! But I tell him every now and then to calm down a bit." Alun Wyn Jones went to Llandovery College, perhaps more befitting a man who would pursue a legal career rather than one in rugby. Ultimately, he did both; he recently completed a law degree and may, like his late father, continue that path, too. "When I was a teenager, I never thought I'd ever be a professional rugby player, let alone do some of the things I have." "I remember when he came into the Ospreys when he first started," remembers Adam Jones of a 2005 debut against Leinster. "He was a bit of a fat kid! He's lost some weight since then..."
An international bow followed in 2006. Three World Cups. Three Six Nations titles, two of them Slams. "I was lucky enough to play with him on two Lions tours," says Paul O'Connell, to whom Jones has been widely and favourably compared. "He's a massive engine. I've never seen a fitter second-row. He's 120 odd kilos, a massive man. Most locks are skinnier. "He's also another back-row forward. He can carry. He can tackle and is fit enough to get through mountains of work so others can carry. He's great at restarts and lineouts. "And so level-headed and emotional and passionate; he mixes them all really well. And that's what makes him a great captain." If Jones does carry regrets, his underwhelming achievements for his Welsh region may loom large in his thoughts, particularly when so many Irish counterparts have managed to combine success with club and country. Loyalty Three Celtic League titles is a bare return for his loyalty. "Domestically, you look at the success the Irish teams have had over the years," he said this week. "We're well aware of their calibre and the results they've had in the last 18 months." And yet he personifies a national side who, along with their coach, have somehow managed to mould themselves into a far greater sum of their individual parts; how else to explain their superior international record? "He is the most professional guy I have come across around everything," explains Adam Jones. "He was the first person who had his own physio. He was the first person I every saw stretch on his own without someone telling him to stretch. Yoga and that kind of stuff. "He was always the guy I wanted behind me in the scrum. The thing about him is his work rate. It is relentless in everything that he does. In training, he is 100pc, in everything he is 100pc. "The thing that always stuck with me about him is, he will literally put himself into a hole. Any Test match, any game, he will go 100pc until he can't run any more. "I remember his first Lions Test in 2013, he's subbed, 70 minutes. "Al was so p****d off. He sprinted off the field to prove to the coaches that he wasn't tired. That's the way he is wired. Rory Best smiled at a memory from their time sharing on the Lions. "You come up after a gym session and he's been down and collected the laundry." A gent off the pitch; a giant on it. Few other players would deserve a glory day like him. "There is a big 80 minutes before we can look at the romantic and sentiment side of it," he warns. Wales can wait for such a strong personality.